Posted on February 16, 2018 Posted in Cupcakes	. I noticed the other day that my local shopping plaza has a new, fruit/veg store that also has a lot of Asian and Italian imported groceries (bazaar mix I know) that you can’t get at Coles or Woolworths. After walking around the aisles I stopped and had to suss out the massive range of normal as well as quite unusual flavours of essence/extracts. Some of them I had no idea at all what they were and some I had no idea would exist as an essence. So when I saw the melon flavour and the pear flavour essence I had to buy them to make up unusual recipes. Melon was the one that I most wanted to bake with, as the usual method of melon flavour in baking tends to be very light in flavour if using the flesh of the fruit. As my favourite melon is by far watermelon I decided to use this fruit with the essence and teamed them up with lime (in which goes quite well with majority of melon varieties). In addition to the lime for an unusual spin I researched what else could go with the melon lime flavour, where a recipe of melon and prosciutto skewers caught my eye. 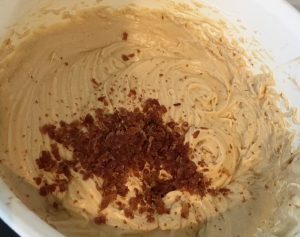 I figured I’ve made chocolate bacon cake with maple frosting in the past which worked like a dream so this could also potentially be a winning combo in a cake. 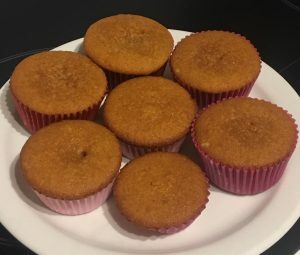 Using my never fail vanilla cupcake recipe as my base I played around with the ingredients to get the texture, consistency, bake outcome and of course flavour that I was pleased with. So if your a melon fan keep an eye out when in grocery specialty stores as you will LOVE this recipe! 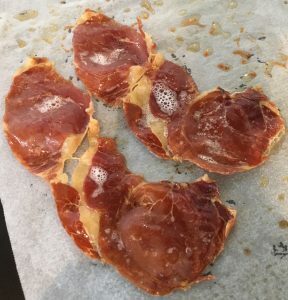 Place the prosciutto slices in a frying pan with a little oil and allow to crisp up. Turn the slices over and fry until brown and crispy, set aside to cool. Once cooled finely dice the meat into small pieces. 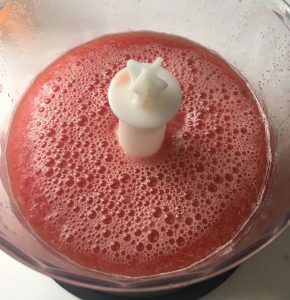 Cut the watermelon and place 900g of the flesh into a food processor. Blitz until liquefied. Pass through a sieve and use the back of a spoon to push all the liquid out, disregard the leftover flesh. 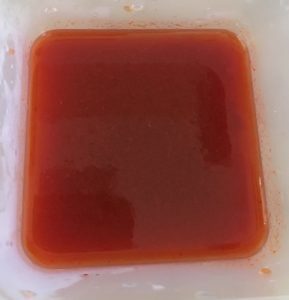 Pour the liquid into a large saucepan with 40g of the sugar and simmer, stirring occasionally, on medium until the liquid reduces down to 140ml. Once you have the required 140ml of reduction set the liquid aside to cool (the reduction process will take about 20 minutes). Meanwhile pre-heat the oven to 175c degrees and line a 16-space cupcake tin with patty cases. In another bowl beat the eggs until light and fluffy with electric beaters. Add the remaining 100g sugar, essence, and zest to the egg mix and beat until pale and fluffy, this will take around 5 minutes. Add the butter and 40g of the chopped prosciutto, beat until combine. Pour half the watermelon reduction (60ml) into the egg cake batter and fold until just combine. Add half the flour mix and fold until just combine. Repeat with remaining reduction (60ml) and flour mix until just combine. Beat the mix on low for 30 seconds with the electric beaters to remove any flour lumps. Pour the batter into each patty cases until ¾ full and place the pan in the oven for 15 minutes of until a skewer inserted into the middle comes out clean. 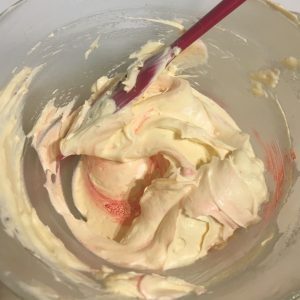 Meanwhile, make the icing by placing all the icing ingredients in a bowl and whisk with electric beaters for 5 minutes. 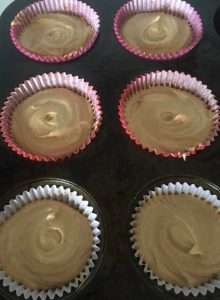 Once the cupcakes are cooked leave on a cooling rack until cold. When the cupcakes are cold place the icing in a piping bag with a star nozzle and pipe the icing as you wish. 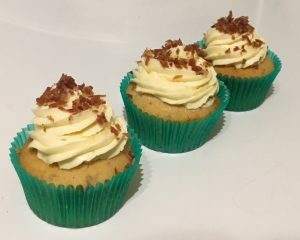 Top icing with scatters of the remaining 15g of prosciutto and enjoy! I have deliberately ensured an extra 10ml of reduction for the ‘just in case factor’. For a cheat and to cut down the recipe prep time you can use store brought melon nectar instead of the watermelon reduction. 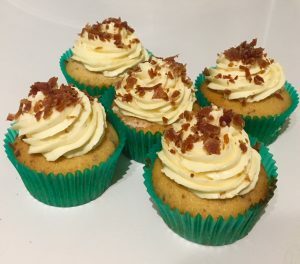 Tags: cupcakes, lime, Melon, Melon Lime and Prosciutto Cupcakes, Prosciutto, watermelon	.